Accelerated Instrument Rating Course – Get Your Rating In 14 to 21 Days! What is an Instrument Rating and why should I have one? An Instrument Rating is a rating that is added to a Private Pilot or Commercial Pilot License and refers to the qualifications that a pilot must have in order to fly under Instrument Flight Rules or IFR. It requires obtaining additional flight training from a qualified Certified Instrument Flight Instructor (CFII), including rules and IFR procedures to enable the pilot to legally and safely operate a properly equipped aircraft in Instrument Meteorological Conditions(IMC). Additional instruction in weather and more intensive instrument flight training in flight solely by reference to instruments is the core of Instrument Flight Training. Testing consists of a knowledge test and a practical test (known more commonly as a check-ride). The check ride is divided into an oral part and a flight part. For most pilots, the most significant value of flying under IFR is the ability to fly in instrument meteorological conditions (such as inside clouds). Additionally, all flights operating in Class A airspace must be conducted under IFR. In the United States, thus any pilot who plans to operate an aircraft capable of flying above 18,000 feet, such as a turbo-prop or a very light jet (VLJ) will definitely need to have an instrument rating. An instrument rating is also required when operating under Special Visual Flight Rules (SVFR) at night. What kind of training would I need to get my Instrument Rating? Under the FAA’s regulations in Part 61.65, a person applying for an instrument rating must receive and log ground training from an authorized instrument flight and/or ground instructor or have completed a home-study course which will sufficiently prepare the applicant to pass the FAA Aeronautical Knowledge Exam. The knowledge exam covers areas such as FAA regulations, the air traffic control (ATC) system, IFR navigation for enroute and instrument approach procedures, weather and decision making skills. 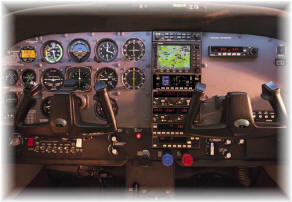 Additionally, the Instrument Rating candidate needs to have logged at least 40 hours of simulated and/or actual instrument flight time (up to 20 of these hours can be logged on an FAA approved flight simulator, the remaining 20 must be logged in an airplane with an appropriately rated safety pilot), 15 hours of instrument flight instruction with an authorized instrument flight instructor (CFII) of which at least 3 hours within the preceding two calendar months prior to the Practical Test. How much will my Instrument Rating training cost? Does the flight school have an FAA approved simulator (simulator time is much more cost and time efficient than aircraft flight time)? Whether or not you have already logged some or all of your prerequisite PIC cross-country time. The frequency of your flight lessons. At least 3 lessons a week is recommended in order to maintain a maximized retention rate. Accelerated Instrument Flight Training is the best scenario for getting your instrument rating in the most cost and time efficient way possible. How much RECENT flight time you have logged. A rusty pilot will likely need additional time to complete their training due to degraded overall piloting skills. There are other factors that can impact your total investment but these are the main ones for consideration as you plan for your Instrument Rating flight training. We hope you have found this information to be helpful. If you have any additional questions, please don’t hesitate to contact us. We would love to hear from you!